You may have noticed that I don't post a lot of savory recipes, mostly because I tend to eat the same meals over and over again. Plus, they're boring anyway and usually not post-worthy. Whether sloppy joes are exciting enough to feature or not, I've decided that it's their time! Aside from the obvious association with Adam Sandler's Lunchlady Land ("...hoagies and grinders, hoagies and grinders, sloppy joes, slop-sloppy joes...")(yeah, that one'll get lodged in your head and stick there for days! )(you're welcome), the dish known as sloppy joes* also happens to be quite delicious. It's a fairly versatile recipe too--you can make it with whatever meat you want/like/have on hand/need to use up, and you can season it exactly as you please. I like mine a little sweeter than most and happen to be a fan of oregano, so there you go. Note: Napkins and/or bibs are totally necessary. Just embrace it; after all, the word sloppy is in the name. Reduce heat to medium and cook onions, peppers, ketchup, brown sugar, mustard, Worcestershire sauce, red wine vinegar, and oregano with meat for 5 minutes. Reduce heat to simmer and cook mixture 5 minutes longer. Serve on rolls, sliced bread, or buns. I love it when people post savory recipes, because I make the same stuff over and over again too. I love getting new ideas. 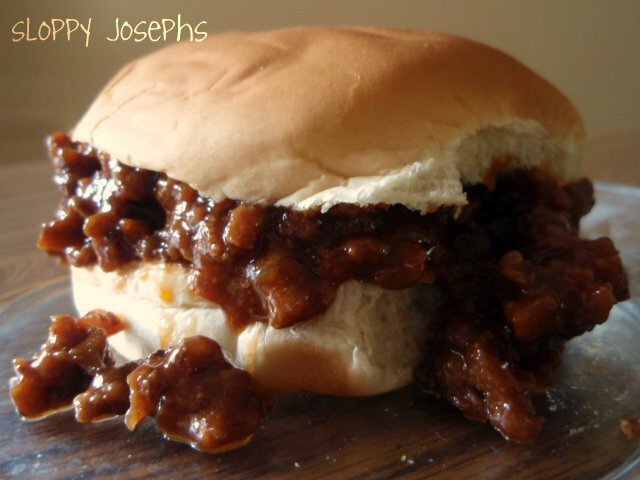 Your sloppy joes/josephines look way more interesting than mine, and I'll definitely give them a try! This is referred to as a 'mince roll' on Scotland. It is one of my favourite things to eat ever. yessssss please! Been ages since I've had some of this. Wait??? No Cinnamon??? I kid I kid! I love lunchlady land if it's filled with sandwiches like these! Oh yes, sloppy joe's are delicious; must have one every once in awhile.....like maybe tomorrow Grace, after seeing your yummy looking joseph! I would destroy several napkins on this one, because that's what I do. And I'm all over savory recipes. We cannot exist on sugar alone. Okay, so maybe. Too funny!b I did sloppy chucks (with chuck roast) a while back! Not a single thing boring about this meal Grace. It looks fabulous!!! I love Lunchlady Land! I'll enjoy having it stuck in my head today. The best thing about a sloppy joe is the sloppiness! ohhhhh, I haven't thought about this deliciously messy sandwich is ages--this picture is calling to me ...I really want this for dinner now!! Looks yum, yum, yummy!! This is something I haven't tried yet! Your Josephines look absolutely mouthwatering! LOL I am never calling them Joe again! Looks awesome, and I agree sweet all the way. Eh to Revolution, undecided to Elementary and yay in a weird crazy way to last resort. Sloppy josephines... I love it! Yum, this looks so tasty. I really want to eat this tonight. This sounds delicious! Sloppy Joes are about the best Saturday night dinner ever! I tend to cook the same things over and over, too; it's kind of comforting. BTW: I LOVE that song....Ladies Who Lunch. I haven't had a sloppy joe in ages... thanks for the tasty reminder! I totally want one of those for dinner tonight, seriously my mouth is watering! Ohmygoodness, totally worth the fact that I wreck every shirt I've ever worn while eating a sloppy joe! (Yes, I'm a super messy eater...and yes, I need a bib. :) ) You have no idea how badly I wish I could reach right in and grab that beautiful sloppy sandwich! This looks amazing,Grace!I love all your desserts, but this dish is fantastic! I was actually thinking about sloppy joes this morning because I was remembering meals my mom used to make for us when we were kids! Those would be so yummy for lunch! Sloppy joes sound awesome right about now; with these dreary weather, I'm really craving a hearty meaty dish!